My mom make this a lot as it's simple and healthy, plus hardly much cleaning up since it's a steamed dish. My boiboi loves this, hence I created this at home using very very basic ingredients which one can easily subtitute with others. One of the best dish to hide vegetables for fussy kids. 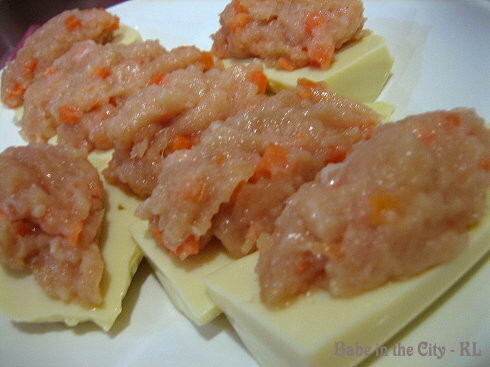 All one need is minced meat, here I've used minced chicken fillets which you can substitute or have a mixture of fish paste, prawn paste, or pork, if using chicken or pork, do add some water to the mixture to soften it. Add in chopped or diced carrots, and/or turnips and/or water chestnuts, very flexi here, some spring onions will be nice as well. Pour in some soy sauce and pepper to taste. Mix in some cornflour thoroughly. Set aside. We use the smaller tubes of egg tofu, if not mistaken it's RM2 for 3 tubes but can use the larger tubes. Cut the tube into half then halves the tofu lengthwise, so each tube will make 4 pieces. Arrange the tofu on a heat proof platter. 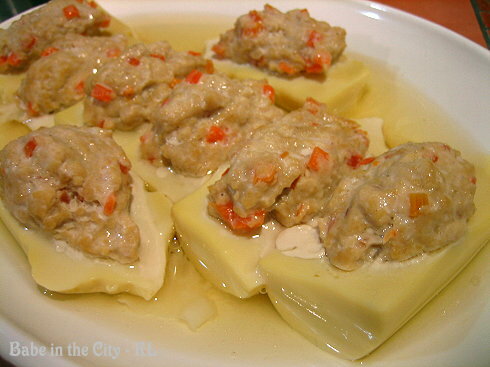 Place the minced meat mixture on top of the tofu pieces. Steam the tofu pieces for about 12-15 mins, I'm using an electric steamer so you might need to adjust your timing according to the heat. Serve hot with rice.